Don’t miss the chance to spend a magical 6 days Cairo, Luxor, Aswan & Abu Simbel tour between all the majestic destinations of Egypt. Cast your eyes on the glorious pyramids of Giza, the mesmerizing Egyptian museum in Cairo. Behold all the breathtaking landmark of the great city of Luxor like the hypnotic Valley of the Kings, the beautiful temple of Queen Hatshepsut, the phenomenal “Two temples of Abu Simbel”, and all the other incredible monuments of the great city of Aswan. -Tour Location Will Be In Cairo, Luxor, Aswan & Abu Simbel. First Day : Arrival to Cairo "Land Of The Pharaohs"
Once you arrive at Cairo airport, our company representative will help you with finishing all of your passport formalities and luggage identification, then you will be driven by an A.C car to your 5* hotel in Cairo. In the evening, you will enjoy a dinner cruise with your tour guide at the sight of a colorful belly dancing show with a folklore band and a stunning Tanoura spin. Then return back to your hotel. After waking up and having your breakfast, your private tour guide and you will set on your adventure in the land of mystery. 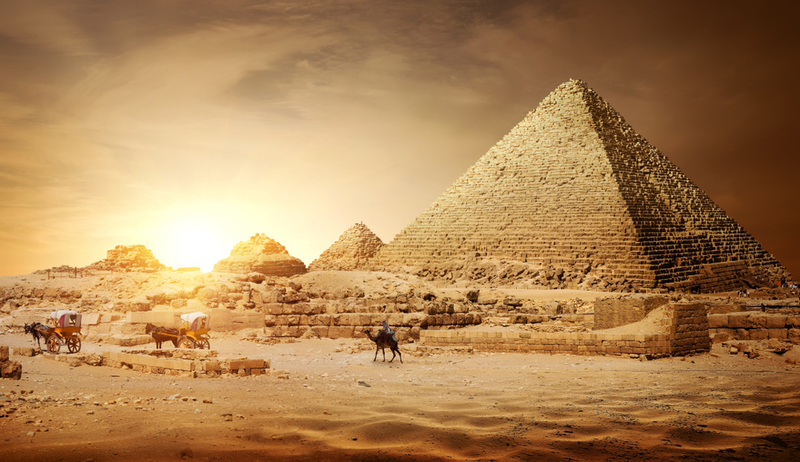 Start your Cairo, Luxor, Aswan & Abu Simbel tour by visiting the famous Giza Pyramids complex that dates back to 2400 years B.C and holds all the Great Pyramids of Giza (Cheops, Chefren, and Mykerinus), the great Sphinx and the Valley temple. You will start with The Pyramid of King Khufu which is properly the most famous because it’s the largest pyramid in existence as it reaches the height of 147 m and about 2,300,000 stones were used to build it on the course of 20 years. Then move your eyes to The Great Sphinx, the oldest known monumental sculpture. After that turn to the mysterious "Valley Temple" which was for the sole purpose of mummifying the dead. Then your tour guide will pick you up to have your lunch. then end your Cairo tour by paying a visit to The Egyptian Museum that displays more than 120,000 genuine artifacts that vary between Roman, Greek and Arabic origins. It also includes Tutankhamen collection of treasures that date back to more than 3,500 years which makes it one of the world’s most important museums. Then, we will transfer you to Cairo airport to catch your flight to Luxor, upon arrival check-in 5* hotel and start a new stage of your Cairo, Luxor, Aswan & Abu Simbel tour. 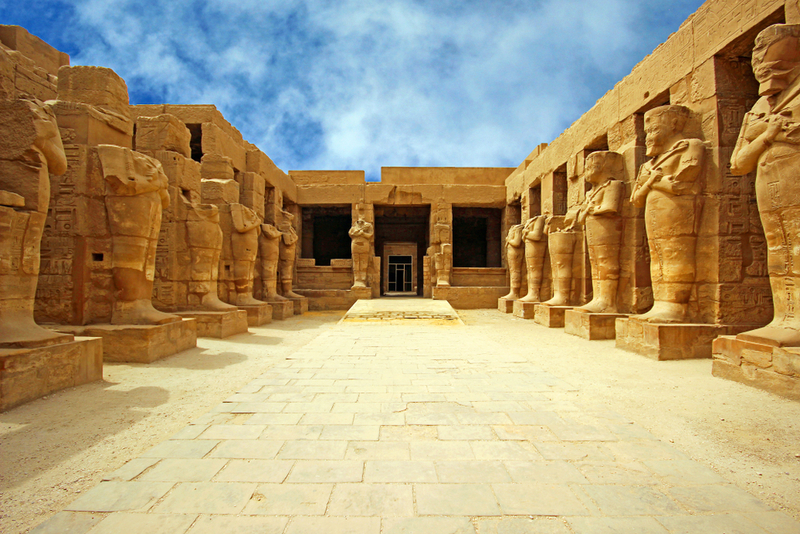 Directly after having your breakfast, prepare to the breathtaking part of your Cairo, Luxor, Aswan & Abu Simbel tour. As you will head with your tour guide to The Valley of The Kings that hold the tombs of Egypt’s kings and Queens from the 18th to the 20th dynasty. The valley contains beautifully decorated well-preserved tombs of Pharaoh Ramesses II and the young (Pharaoh Tutankhamen) that contained many precious and valuable materials which might need in the afterlife. 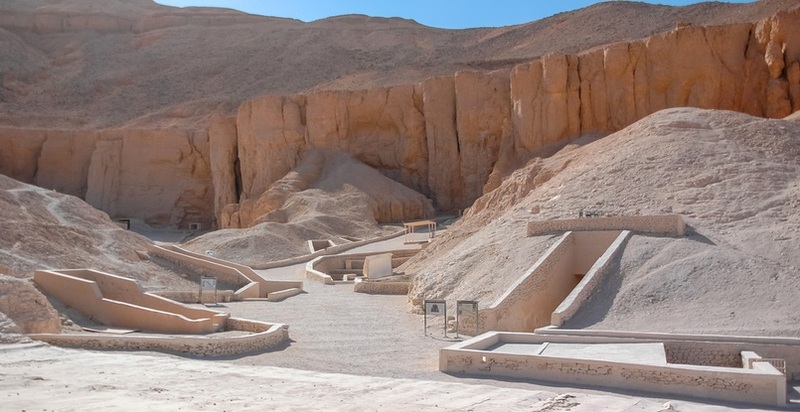 Then transfer to visit Queen Hatshepsut temple which is a true example of the advanced level of classical architecture the ancient Egyptians were able to reach as it was built on three levels and one of the best-preserved temples in Egypt. Continue to the Colossi of Memnon which are two twin massive stone statues of Pharaoh Amenhotep III made from blocks of quartzite that were moved 700 km from Cairo to Luxor. Then have your lunch and prepare yourself to visit the largest temple in the world. Then turn to the Temple of Karnak which is the largest and oldest house of worship ever built by man on 147 acres on land, it was enlarged over the generations by many Pharaohs who desired to serve the gods. Finally, return to your hotel for the overnight. In the morning, after having your breakfast, move to Luxor train station to get to Aswan. Upon arrival join your private tour guide to visit The High Dam which was built between 1960 and 1970 across the Nile and had a positive effect on the economy and culture of Egypt. Continue with your tour to visit the Unfinished Obelisk which is the largest obelisk ever built by an order by Queen Hatshepsut as its height is 42 m and weighs 1.200 tons, then move to have your lunch with your tour guide. 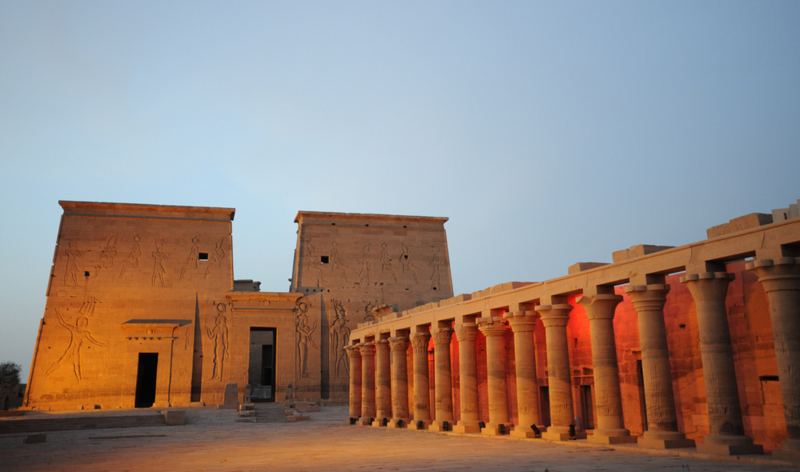 After that move to explore Philae Temple which was built to honor many gods like Isis and Hathor, it contains many stories about Osiris and Horus. In 1960 the UNESCO relocated the Entire complex to the Island Of Agilkia to escape the dangers of the Nile floods. Finally, return to your hotel for the overnight. In the morning, get ready to witness the most historical landmarks in the world Abu Simbel Temple, we will transfer you by an A.C car with your breakfast boxes. The two temples of Abu Simbel are known to be a true masterpiece and a magical sight to behold. 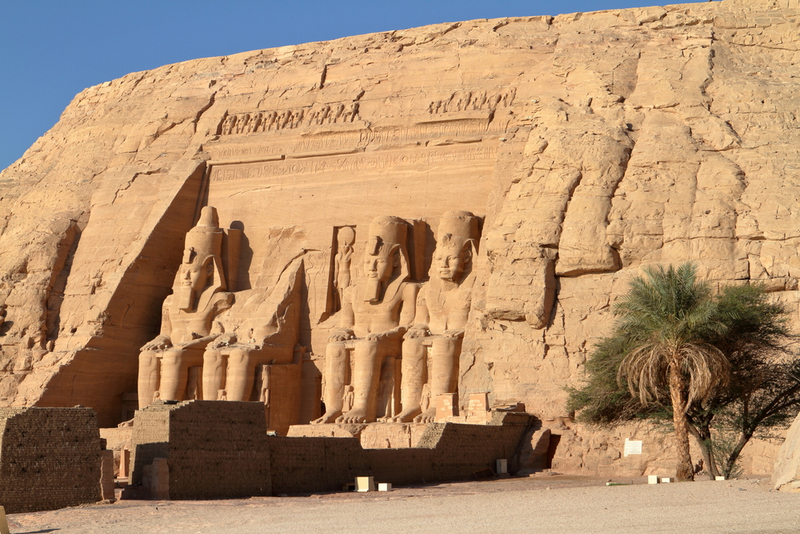 Abu Simbel was built to honor (King Ramses II), the second temple belong to his wife (Queen Nefertari) in 1200 B.C. The great temple is dedicated to ancient Egyptian gods like (Ra, Amun, and Ptah while the smaller one honors (The goddess Hathor). All the decorations, carving, statues and the general artwork is pure magic and an absolute pleasure to witness. After your tour, we will transfer you to Aswan airport to catch the flight to Cairo and overnight at 5* hotel. Enjoy your breakfast at the hotel, then our representative will transfer you to the airport and help you finalize your departure papers to end your Cairo, Luxor, Aswan & Abu Simbel tour. Accommodation at 5* hotel in Cairo for 2 nights. Accommodation at 5*hotel in Luxor for 2 nights. Accommodation at 5*hotel in Aswan for 1 night. An Expert Egyptologist tour guide during your tour. All the transfers around Egypt will be by a private A.C car. Train ticket from Luxor to Aswan. Flights tickets from Cairo to Luxor and from Aswan to Cairo. All the entrance fees to the sites, taxes, and services are included in your program. Drinks and any personal expenses will be paid from your own pocket.